Researchers have now discovered that spider silk, which is familiar as one of the robust materials for its weight, has another strange property that could open the door for innovative types of robotic actuators or artificial muscles. The resilient fibers found by the researchers respond very firmly to variations in humidity. Over a specific level of relative humidity in the air, they contract and twist all of a sudden, exerting adequate force to prospectively have an edge over other materials being explored as actuators—devices that move to carry out certain activities such as controlling a valve. The study outcomes were published in the Science Advances journal on March 1st, 2019, in a paper by MIT Professor Markus Buehler, head of the Department of Civil and Environmental Engineering, along with former postdoc Anna Tarakanova and undergraduate student Claire Hsu at MIT; Dabiao Liu, an associate professor at Huazhong University of Science and Technology in Wuhan, China; and six others. Recently, scientists found out a characteristic of spider silk known as supercontraction, where the slender fibers have the ability to shrink without warning in response to variations in moisture. The new outcome is that the threads not just contract but also twist, offering a strong torsional force. “It’s a new phenomenon,” stated Buehler. We found this by accident initially. My colleagues and I wanted to study the influence of humidity on spider dragline silk. Dabiao Liu, Associate Professor, Huazhong University of Science and Technology. This is a fantastic discovery because the torsion measured in spider dragline silk is huge, a full circle every millimeter or so of length. This is like a rope that twists and untwists itself depending on air humidity. The molecular mechanism leading to this outstanding performance can be harnessed to build humidity-driven soft robots or smart fabrics. Pupa Gilbert, Professor of Physics, Chemistry, and Materials Science, University of Wisconsin at Madison. Gilbert was not involved in this study. The excellent flexibility, resilience, strength-to-weight ratio, and toughness of spider silk are already known. Several research groups across the globe are making efforts to reproduce these properties in a synthetic variant of the protein-based fiber. Although the purpose of this twisting force is not known to the spider, researchers consider that the supercontraction caused by the moisture could be a means to ensure a web is pulled tight while reacting morning dew, maybe to protect it from damage and to maximize its responsiveness to vibration to enable the spider to sense its prey. “We haven’t found any biological significance” for the twisting motion, stated Buehler. However, using a combination of molecular modeling with computer as well as lab experiments, the researchers could find out the way the twisting mechanism works. It has been found that it is based on the folding of a specific type of protein building block, known as proline. Analyzing that underlying mechanism necessitated thorough molecular modeling, which was performed by Tarakanova and Hsu. “We tried to find a molecular mechanism for what our collaborators were finding in the lab,” explained Hsu. “And we actually found a potential mechanism,” based on the proline. They demonstrated that this specific proline structure always led to the twisting during the simulations; however, its absence led to the lack of twisting. “Spider dragline silk is a protein fiber,” explained Liu. “It’s made of two main proteins, called MaSp1 and MaSp2.” The proline, which is very important for the twisting reaction, is found inside MaSp2, and following interaction of the water molecules with the protein, they interrupt its hydrogen bonds in an asymmetrical manner, causing the rotation. The rotation occurs only in a single direction, and occurs at a threshold of nearly 70% relative humidity. “The protein has a rotational symmetry built in,” stated Buehler. Moreover, by means of its torsional force, it renders “a whole new class of materials” feasible. With the discovery of this property, he indicates that it can be reproduced in a synthetic material. “Maybe we can make a new polymer material that would replicate this behavior,” stated Buehler. Silk’s unique propensity to undergo supercontraction and exhibit a torsional behavior in response to external triggers such as humidity can be exploited to design responsive silk-based materials that can be precisely tuned at the nanoscale. Potential applications are diverse: from humidity-driven soft robots and sensors, to smart textiles and green energy generators. Anna Tarakanova, Assistant Professor, University of Connecticut. It could also be that other natural materials display this property; however, if this is the case, then it has not been observed. “This kind of twisting motion might be found in other materials that we haven’t looked at yet,” stated Buehler. Apart from prospective artificial muscles, the discovery could also result in precise humidity sensors. Huang was not involved in this study. The study included collaborators at Huazhong University of Science and Technology and Hubei University, both in Wuhan, China, and Queen Mary University of London. 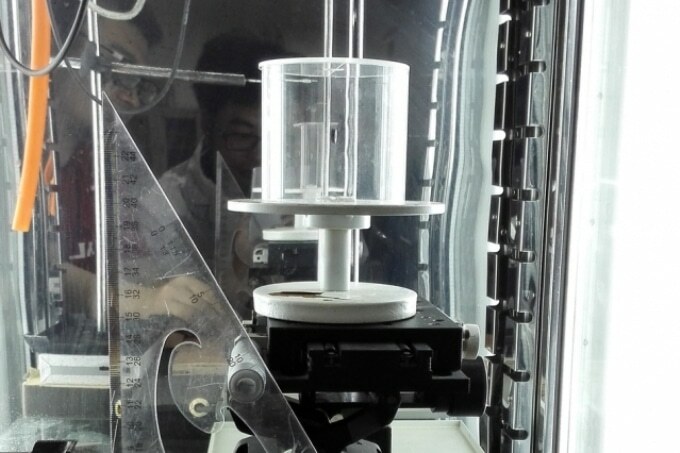 It was funded by the National Natural Science Foundation of China, the National Science Foundation of Hubei Province, the Young Elite Scientist Sponsorship Program by CAST, the National Institutes of Health, the MIT Undergraduate Research Opportunities Program, and the Office of Naval Research.